Morning all, I am guessing everyone is enjoying the glorious sunshine we have been having this past few days, this spring weather has certainly made such a difference around here. Today I thought I would show you some more of the scotty/westies that I have been making. These 3 have gone to their new homes already and I was quite sad to see them go. The felt I used was from the fabulous Felt Fairy I must admit I love it, I have used some old scraps of cheapy felt on other things and it just isn't the same at all. I was so busy last week with poorly children and lots of other things that I didn't manage to do any DT work but I must tell you about the challenge over at Craft your Days Away. This fortnight we have a Mothers Day/special lady theme and of course you can make anything as we are a multi crafts challenge blog. This fortnight we are sponsored by One Stop Card Crafts with a £10 spend instore which is fantastic! 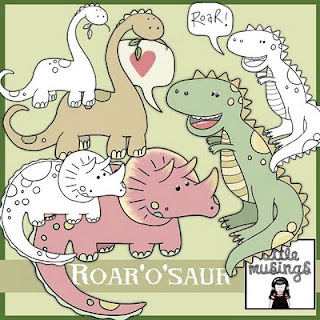 Also if you haven't popped over to Little Musings lately then you may not have seen the most recent set of digi stamps which are DINOSAUR related which means they are perfect for boys makes or girls for that matter and of course you can colour you own or use Sj's pre coloured images which are brilliant. The set is only £1.50! Sparkles forum Challenges Has a Mothers Day theme still going on so if you have a special make doesnt have to be a card then pop on over at add it so we can pop by and see you makes! A new challenge will be starting this sunday. Right off to get some things done. p.s. to all those lovely lovely people who have sent me awards I truly do appreciate every one of them I just never get around to popping them up, I will try to be more organised in future, but I just wanted to say THANK YOU! I love your littlr dogs so cute! Lisa they are sooooo cute !! Just love the colours you have used !! Oooh lovely little westies Lisa, and the stitching looks brill. You are putting me to shame as I have a mountain of sewing to do and all it's doing is collecting dust lol..
Awwwww i LOVE your little poochies, they are so dame cute..
Hope your children are better hun. Oh I love your dogs, fab colours! I can see why you were sad to see them go, I would be too LOL! these are gorgeous! I have recently started working with felt and was wondering what you would recommend from the felt fairy. Is there different thicknesses? I would also like some to make bags so probably about 4-5mm thick, do you have that? Thank you for stopping by, I appreciate every single comment! I'm a married mum of 3 children. Owned by 2 westies. I love to crochet, sew and do lots of other crafty bits and bobs along the way. I hope you like browsing my blog please do leave a message, I love reading your comments. Angels - Little Musings Stamps!!!!! Daziedelights. Awesome Inc. theme. Powered by Blogger.